The Beaufort Sea is nearly completely skimmed with ice, at a date it was barely half ice-covered two years ago, and only three quarters ice-covered last year. This is a handy bit of sea-ice trivia I park in a holster, to use when nit-picking with Alarmists. If they insist upon cherry-picking certain data from certain warmer parts of the arctic, I am perfectly capable of counter-cherry-picking right back at them. Anyway, in my book cherry fights are far better than knife fights, (though about as red). In Alarmist circles, nearly all eyes are focused on surges of Atlantic air, with occasional injections of Pacific air, rushing up to the Pole, and fueling anomalous low pressure I have nicknamed “Ralph”. This creates a definite warm anomaly in the DMI temperature-north-of-80°-latitude graph. This suggests to some Alarmists that the Pole is warming, but there are some glitches in their gladness. For one thing, these warm surges have been going on for about as long as I’ve been talking about “Ralph”, and may be due to the “Quiet Sun” being at rock bottom minimum. The autumns showed above-normal anomalies in both 2016 (left) and 2017 (right). If warm air surging to the Pole truly resulted in “less ice”, we should see a decrease of ice over the past three years, but we have not seen it, at the sea-ice minimum. Therefore Alarmists focus at the period after the minimum, where indeed extents are at low levels. 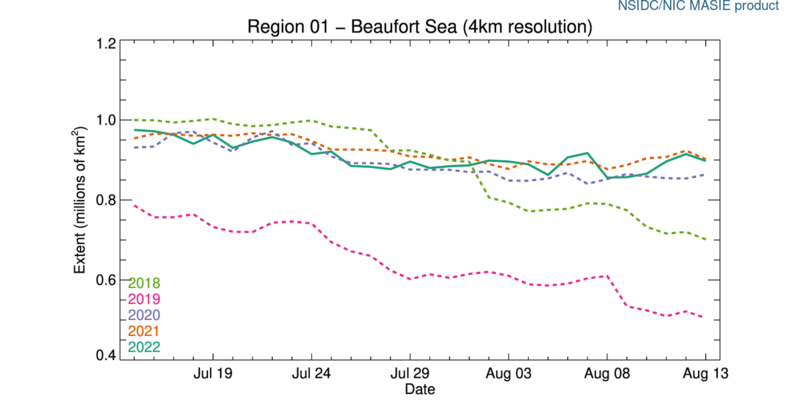 One should immediately be curious how the extent can be below normal, since we began this post mentioning how there was more ice than in recent years in the Beaufort Sea. 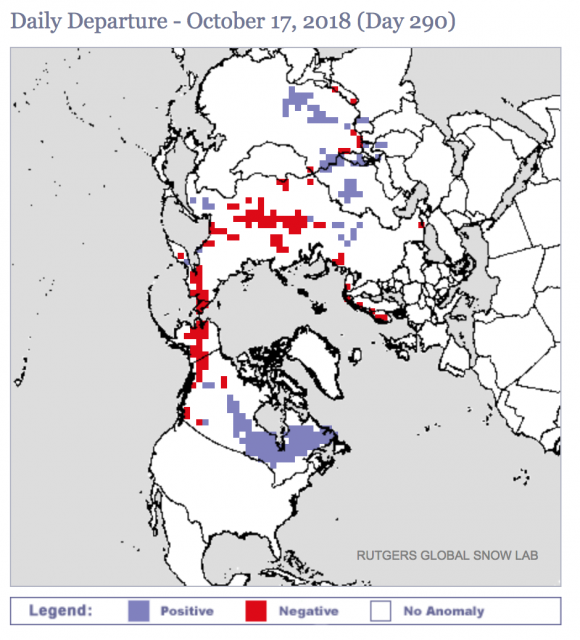 The answer is that there is less ice on the Eurasian Side of the Pole. This actually remains a good year for making the Northeast Passage, even as it was a bad year for making the Northwest Passage. 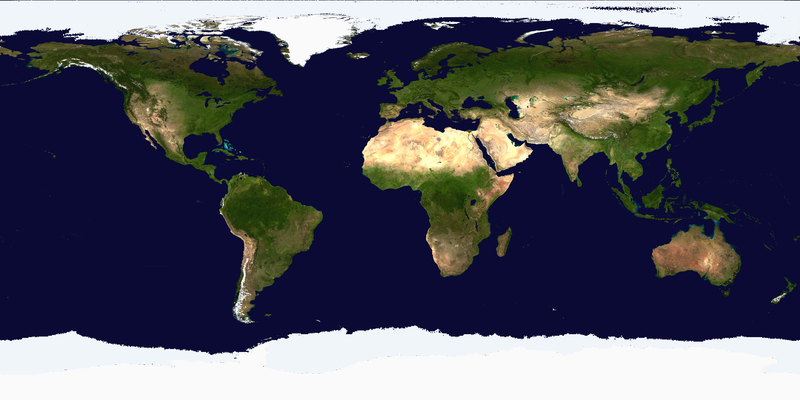 The arctic coasts of Eurasia remain ice-free, as the arctic coasts of North America are ice-bound. Lastly, if the Atlantic pumps heat north, dislodged northern cold must exit somewhere else, and so far it seems to be exiting east of Alaska, heading straight south through the Canadian Archipelago, across flat prairies and continuing south all the way to Texas. The “Ice Age Now” site has reported grain farmers in the Great Plains having problems harvesting due to early snows. Though I live far from the arctic, people in these parts do become alarmed to some degree when our food is threatened, depending on our level of awareness. Also worry about potentially cold winters can be upsetting to those poor (and often elderly) who may have to chose between food or fuel. It is little concern to such people if the arctic is “only” -10°C, which is +10° of normal, when the displaced cold air drops temperatures to -20° of normal in Arizona. It may well be that the increased sea-ice in the Beaufort Sea is indicative of the sort of nasty winter where a ridge builds up the Pacific coast of North America, bringing south winds to Alaska and pleasing Alarmists up there, but bringing the arctic plunging south, east of the Rocky Mountains. What is being seen is a “loopy” pattern, where warm air is brought north, dislodging cold air which comes south. Largely it all balances out. It is a case of six of one or a half dozen of the other. The planet’s temperature is currently less than two tenths of a degree “above normal”, and Al Gore looks foolish for stating “The planet has a fever!” The average healthy human’s temperature varies more than that, during an average day, without thinking any sort of “fever” is involved. Unfortunately the above chart fails to show sunspot cycle 19 was much bigger than 21 or 22, (and 18 was also big; bigger than 22 but not 21). So the start of the above graph is showing a hidden effect. But what is the effect? We have actually measured an increase in cosmic rays bombarding the earth, as the sun goes quiet, which may increase the cloud cover. However I also noticed there were more La Ninas back when the sun was “noisy”, and more El Ninos now that the sun has gone “quiet”. It could be coincidence, but I have a hunch the energy of the sun may effect trade winds, making them ever so slightly faster when the sun is “noisy”, and ever so slightly slower when the sun goes quiet. The thing of it is this: The best and most brilliant scientists may look a bit like morons, when it comes to predicting when a La Nina will shift to an El Nino, and vice versa. Whatever brings about the change is a force too small and too subtle to measure with our currently crude computers and currently too-clumsy instruments. Therefore I fall back on what we do know. And what we do know is that increased trade winds effect the up-welling of cold water that occurs hand-in-hand with La Ninas, and decreased trade winds decrease the upwelling, which goes hand-in-hand with El Ninos’ warmer surface waters. We also know both El Ninos and La Ninas feed upon themselves up to a certain point, and then become authors of their own demise. La Ninas involve clear skies, which eventually allows the sun to warm waters, which encourages El Ninos. El Ninos, on the other hand, encourage cloudy skies, which cool waters, which encourages La Ninas. In other words, it is an oscillation. But why were there more La Ninos when the sun was noisy? And why are their fewer now the sun is quiet? I don’t know why. But it seems it happened. I’d like to throw out this idea, which involves counter intuitive thought. When the sun gets “noisy” the trade winds increase in some slight manner that effects the tipping-point between El Nino and La Nina. There is more up-welling of cold water, so the planet appears colder even as the sun is hotter. Cooler weather causes the tropical sky to be clearer, and consequently the tropical oceans are absorbing more heat even as the planet appears colder. Currently the opposite is the case. There is less up-welling of cold water, so the planet appears warmer even as the sun is colder. More warmth increases the clouds in the tropics, so those seas are actually cooling even as they release more heat to make the planet warmer, for they are no longer absorbing so much sunshine. These contradictions can’t go on forever. The contrary thought involved is too contrary. Eventually the colder sun will result in a colder planet. A new tipping-point will be reached, and a new swing of a new oscillation will dramatically change things. The oceans will run out of extra heat supplied by the noisy sun of cycles 18 and 19, and some new pattern will appear, and likely blow our minds. I hope I live long enough to see it happen, because I love to see our Creator surprise us with his Majestic stuff. But in the meantime I’m happy watching the counter intuitive reality which includes the sun getting quiet, but the planet getting warmer. There is one place where it has gotten colder when the sun is “quiet”. It has been the Pole, when the sun is shining. Summers have been colder at the Pole as the sun has gone quiet. It is a slight difference, less than a degree Celsius, but quite obvious in the DMI graphs going back to 1958. It is a cherry Alarmists refuse to pick, preferring to look at the above-normal temperatures apparent at the Pole when the sun doesn’t shine. I suppose you could call cooler-summer-temperatures a choke-cherry, for Alarmists find it distasteful when I pick it as a sort of counter-cherry-picking. However it is also very significant, I think, outside of the silliness of cherry fights. Because the Arctic Sea is far from the Trade Winds, and, because it remains ice-covered through much of the summer and “upwellings” can’t effect air temperatures until patches of open water are seen in August, it is a sort of labratory where the effects of noisy and quiet suns can be seen without the intrusions of other, busy-body variables. And what do we see? We see the quiet sun is, in fact, cooler. However this coolness is, in and of itself, a pebble that can trigger another avalanche, involving a different oscillation, different from the oscillation between La Ninas and El Nino’s. This different oscillation is the switching between a “Zonal” pattern and a “Meridional” (loopy) pattern. My guess is that when the “quiet sun” makes the Pole colder even as it makes the tropics warmer, it creates an imbalance, and the way the planet ends this imbalance is to shift from a Zonal pattern to a Meridional (loopy) pattern. The excess warmth in the tropics finds a faster route to the Pole, where it is radiated to outer space. Because this milder air is displaced northward, the cold air that ordinarily resides over the Pole is bumped southward, bringing snow further south and somewhat “accidentally” further cooling the planet, as the albedo of southern snows reflects a lot of sunshine. At this point my jaw starts to drop, and I stand in awe of the Creator. After all, these two oscillation are but two out of many “variables.” It is like we are trying to gauge the music of a Beethoven Symphony by watching an oboe and third violin. People who focus on CO2 are trying to measure a symphony by watching a little old man over to the side whose sole job in the majesty of the swelling crescendo is to ding a triangle, once in a while. Meteorology is a awesome and majestic subject, but I fear we puny mortals are reducing it to complete absurdity, and missing much that is wonderful in the process. 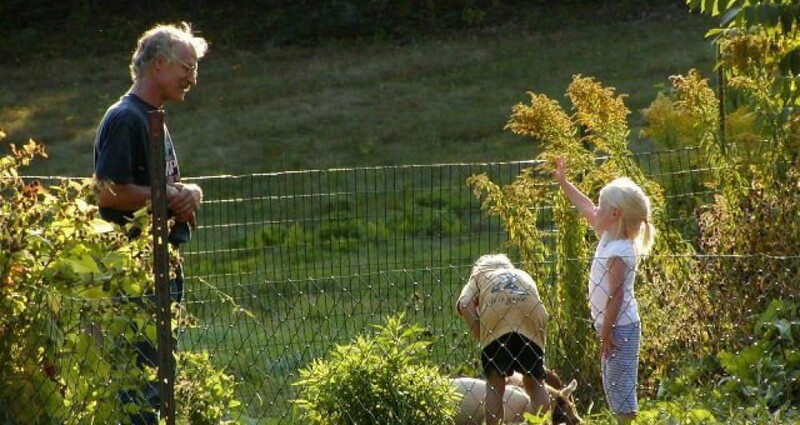 It reminds me of a hilarious scene in the French farce, “The Tall Blond Man With One Black Shoe”. The entire movie is well worth watching, but you will have to scroll ahead to 41:00 to see the scene that I feel resembles the farce we have made of meteorology. In a particular French orchestra, a male kettle-drum-player is married to a female harpist, but she is having an affair with the first violinist. If this disharmony wasn’t a bad enough wrench in the works of a group of people supposedly dedicated to making harmony, the first violinist has been mistaken as a foreign spy, because he wore one black shoe and one tan shoe at an airport. (An added disharmony is that the second-in-command of the the French spies is attempting to replace his boss.) In any case, the music which this situation produces is nothing like Mozart intended. I like to think that the reason God doesn’t just sizzle us with a lightning bolt, for our foolishness, is that he is helpless with laughter, because to Him we look like the orchestra in the above movie. We, of course, take ourselves far more seriously, though not even I can match the seriousness of Alarmists. Meanwhile the symphony of God’s creation is quite capable of proceeding without us. It does not require our understanding to manifest. Currently warm air streams up toward the Pole through the North Atlantic, fueling incarnations of “Ralph” around and over the Pole. Considering weather so often proceeds in a manner that is counter-intuitive, you might wonder why I find any delight in it. I suppose the reason I find delight in it is the same reason I find delight in the music of a master like Bach, Beethoven or Mozart. I think I am following the thread of their music, and can predict where it will go next, but they surprise me by taking off into a rhapsody I never expected. Although they prove me wrong, I delight in what they reveal. In like manner, weather is constantly taking off into a rhapsody meteorologists didn’t expect. Good meteorologists are grateful for the chance to see something new and learn more. Bad meteorologists take offence. Most absurd are non-meteorologist Alarmists who not only take offence when the weather proves them wrong, but think they themselves can control the weather. Maybe they don’t throw virgins (or Skeptics) into volcanoes, but they do buy curly light bulbs. Don’t get me wrong. I do not deny the possibility men can to some degree control the weather, but if it occurred it would likely be more probable to occur if one respected the Creator than if one denied there was any such thing as a Creator. In other words, if there was such a thing as an Author of the amazing creation we live within, and people failed to see how amazing and how like a miracle ordinary days are, and had the nerve to suggest the everyday miracle could be bettered, the Author might be inclined to favor those who prayed over those who refused to do anything so silly as pray, and instead thought it was wiser to virtue-signal their political correctness by buying curly light-bulbs. In other words, though I have no scientific proof, I think the person more likely to control the weather might be a small child praying for a white Christmas, whereas an atheist buying curly light bulbs would have no effect whatsoever. Be that as it may, the weather largely proceeds in a miraculous manner, displaying harmony we but dimly comprehend, obeying laws we have yet to discover. Appreciate it. The increase in sea-ice along the coast of Alaska does not make up for the missing ice in the Laptev Sea, and this largely explains why the “volume” graph is back to low levels. One thing to watch for, in terms of the “volume” of sea-ice, is how often the flow goes the “wrong way” in Fram Strait, as opposed to how often sea-ice is flushed out of the Arctic and down the east coast of Greenland. Last year a “wrong way” flow in late February led to open water north of Greenland as sea-ice was shifted north, but also to increased “volume” as the sea-ice piled up in the Central Arctic. (Alarmists picked the cherry of open water, and I counter-picked the increased volume, which was typical for cherry fights.) Currently the sea-ice is surging south in Fram Strait due to the enormous Atlantic gale, but this is common in the autumn. Two things I can confidently predict. First, the cherry fights will continue. Have fun, and don’t let them escalate to knives. Second, the symphony arctic orchestra will play on, displaying a divine harmony. For Skeptics like myself this is a terrible and tragic situation, for I wish it was true. If the sea ice was really fading away we could get back to growing barley in Greenland, and providing food and unfrozen water on Greenland in January, without relying on imports, for the 2000 cows and 100,000 sheep and goats the Vikings managed to keep alive. However it is an illusion. If you draw one of those arrow-straight “trend lines” that Alarmists are so fond of, you can see this year’s rate of decline won’t even match last year’s lows, but Alarmists are already congratulating each other, for they are sure the ice will remain the same distance below-normal it now is, and this year’s minimum extent will beat 2012’s record low minimum. This is tragic to watch, for they are being teased by a tormenting destiny, which rather than ending their delusion with a splash of cold water in their feverish faces, is actually egging them on with incidental evidence they are not crazy, when they are. For example, ordinarily I can gently nudge them to saner thinking by pointing out something like the yearly drop of arctic temperatures to below-normal in May. But this year, (likely due to the lagged effect of an El Nino already fading away), for the first time in years, temperatures are not dropping below normal in May. I don’t see why fate has to be so cruel to Alarmists. It is like encouraging an addict, like telling a person ruined by heroin or crystal meth that they appear normal, and no one suspects they are not quite right, when everyone in town knows they have such a monkey riding their shoulders they can’t even hold an ordinary job. I really don’t like seeing my fellow man reduced to such a tragic state, but it makes things much harder for me when all the “scientific” evidence just encourages the deluded. Heck, I have to go all the way back to 2010 to find a case where temperatures stayed above normal this late in May, before dipping below normal. And when I have to go back six whole years Alarmists will accuse me of grasping at straws. And maybe I am, though they are the ones drowning. It is somewhat embarrassing how unquestioning they are about certain things. 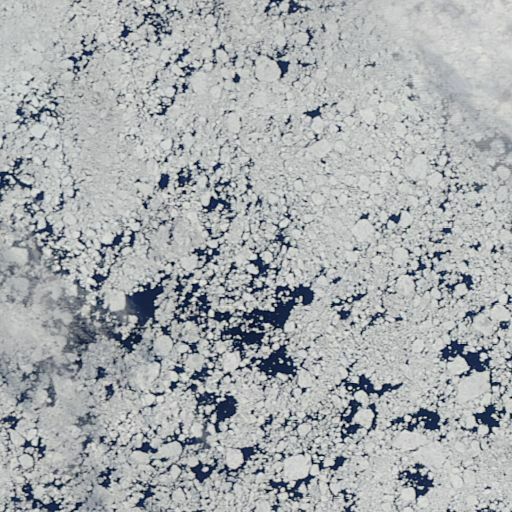 For example, the fellows measuring sea-ice have to tweak their devices around this time of year, because of certain problems satellites have recognizing wet ice from open water. They do the best they can, but sometimes as they tweak things, ice abruptly appears or disappears. The funny thing is Alarmists are furious and out to behead people, when ice abruptly appears, but when it abruptly disappears they don’t raise a finger, nor a feather, and remain smooth and unruffled. Just for an example, check out the waters north of the Mackenzie River Delta in these two maps, from May 9 and May 10. An impossible amount of ice simple vanishes in 24 hours. I am fairly certain that one to two feet of sea ice did not vanish that swiftly, basically overnight. Most likely it involves a data-gathering-tweak. However I will say this: If one to two feet of sea ice appeared that quickly, Alarmists would be all over it, and some would accuse Big Oil or Big Coal or Republicans or people-who-attend-church. It’s silly they can be in such a panic about one sort of unlikely situation, and heedlessly complacent about another. I think I am going to have to learn how to “save” close-ups from this site in order to make certain points. I don’t know how to do it yet, so you are going to have to trust me that the Polynya is bigger than the Canadian map shows, but the “open water” has more swirls of drifting ice than the NRL map shows. But what is not obvious is that when open water appears at this time of year it is not because air temperatures are up to the melting point of sea water. It is because the ice has been shifted somewhere else. And this is yet another cruel trick reality has to tease Alarmists, for it drops the extent of the ice without actually melting any. When the light returned to the arctic, and we could use our lying eyes to assess the visible satellite pictures, it was quite obvious a lot of ice in the Beaufort Sea has been shifted towards Siberia all winter. Not only were there the dark cracks of freshly opened leads, but the light grey cracks of leads that opened months ago and have since frozen over, in some cases to a depth of 3 to 6 feet. A slight amount of the moved ice did get sucked south through Bering Strait and join the parade of sea-ice that moves down the east coast of Asia much like ice moves down the east coasts of Greenland and Labrador. But most of the moved ice stayed up in the arctic, creating numerous pressure ridges in the East Siberian Sea and quite a pile-up along the coast of East Siberia. This body of thicker ice will not effect the ice-extent graph until later in the melt season. Then we shall see if the East Siberian Sea is slower to melt, because the ice is thicker. In the winter of 2012-2013 there was a similar movement of ice in Beaufort Sea, causing a great hubbub in the Alarmist community because it seemed to them that, if the ice broke up in the middle of the winter, surely it would fall apart and melt more quickly in the summer. It didn’t happen. One idea I heard was that so much water was exposed in the winter by leads that the water temperature was lowered under the ice, slowing the melt in the summer. The thing I remember about that summer-of-2013 was the terrible trauma Alarmists went through when the ice failed to melt as they expected. I really don’t like seeing such pain, and I can’t see why, having suffered that way once, they want to do it all over again. But I suppose that is the thing about an addiction. There is something about the “high” so attractive that one goes-for-it, heedless of the ruin it will bring about. Pity such people, but do not expect them to admit they have a problem until they are completely ruined. All an onlooker can do, until the addicts are ruined and plead for help, is to go to work and do your job and record the truth as it happens. The weak swirl north of Greenland didn’t attack the Pole like the winter ones did. The North Atlantic gale is not stuck over Iceland , but is further north, drifting slowly towards Barents Sea north of Norway. Models were showing it getting up to the Pole a week from now, but now are backing away from that idea. The models continue to bounce all over the place, concerning whether the North Atlantic low will wander up to the Pole or not. In the short term it looks like the ridge of the high pressure will stand fast, and the weak but sprawling low over the East Siberian Sea will drift across to the Canadian Archipelago while weakening. That low has drawn some Pacific air north through Alaska and then off shore, giving O-Buoy 14 an early thaw, which will give Alarmists more joy. The thaw is already over, and the ice is still much colder than the air only inches below the surface, but a thaw is still a thaw. This ice is quite far south, having just moved past 77°, compressing north midst the ice that has been generally pushed away from the coasts of Alaska and Canada. Therefore the thaw is not included in the mean-temperatures-north of 80° graph we look at. Hopefully the compression will not build any pressure ridges that take out our only remaining camera. The snow does look like it softened a little during the thaw. Here is the wind field that opened up the polynya (also called a “shore lead”) back in April. And last but not least, in case you hear this polynya is “unprecedented”, here are pictures of similar situations last year and in 1975. This is also from Susan J. Crockford’s research.